On this date in 1942, over a month after Pearl Harbor, 20,000 Japanese Marines quickly overran the Aus­tra­lian gar­ri­son at Rabaul, New Brit­ain, the largest is­land in the Bis­marck Archi­pel­ago (labeled “Niu Briten” on map below). Rabaul’s cap­ture was impor­tant because of its prox­im­ity to the Caro­line Islands to the north, site of a major Japa­nese naval base on Truk. Soon after­wards Rabaul became the prin­ci­pal stra­tegic cen­ter for Japa­nese air and naval forces in the South­west Paci­fic. The island served as the key point for the failed Japa­nese invasion of Port Moresby (May–Novem­ber 1942), the capi­tal and largest popu­la­tion cen­ter of Papua New Guinea. As the Allies wound down their Guadal­canal cam­paign (August 7, 1942 to Febru­ary 9, 1943), they recog­nized that recap­turing Rabaul, with its 100,000 ene­my soldiers and naval per­son­nel, rein­forced by 600 planes, tanks, artil­lery, and other sup­plies, would require more re­sources than they had at their com­mand—a min­i­mum of five extra divi­sions and almost 2,000 planes. How­ever, at the oppo­site (west­ern) end of the is­land, where the Japa­nese were in possession of two air­strips, U.S. Marine and army units swarmed ashore to cap­ture the air­fields they believed would assist them in their planned attack on the Rabaul strong­hold. The Battle of Cape Glouces­ter (Decem­ber 26, 1943 to April 22, 1944), part of Oper­a­tion Cart­wheel, a mixed land, sea, and air operation in the Southwest Pacific (1943–1944), was said by vete­rans to have been “worse than Guadal­canal.” The troops got bogged down in swampy terrain and thick jungle, where the chief enemy was Mother Nature. By this time, how­ever, Rabaul had been effec­tively neu­tral­ized by heavy Allied bom­bard­ment, with over fifty Japa­nese ships and planes sent to the bottom of the harbor there. Because it no longer posed a threat and because of the per­ceived diffi­cul­ty in cap­turing it, war planners wisely decided to “island hop” past Rabaul to attack more lightly defended islands, sparing them­selves another Iwo Jima or Oki­nawa. So impreg­nable were the Japa­nese at Rabaul that it took nearly two years to evacuate all their troops after the war. 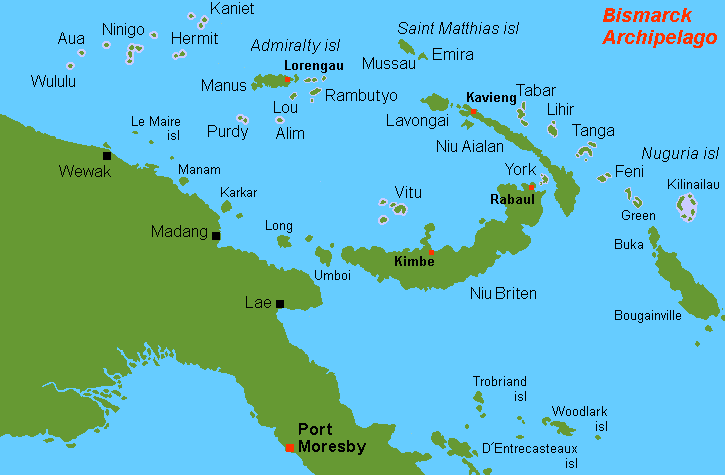 Above: Location of Rabaul and the island of New Britain (“Niu Briten”) in the Bis­marck Archi­pelago, South­west Pacific. Cape Glouces­ter (also known as Tuluvu), which is on the western tip of New Britain, does not appear on this map. 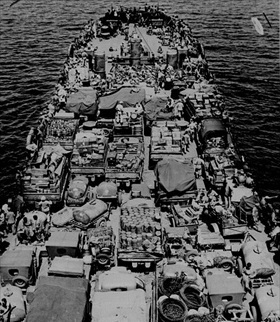 Left: Men and cargo of the 1st Marine Division, veterans of the campaign on Guadalcanal (August 7, 1942 to Febru­ary 9, 1943), are pictured aboard a landing craft for the invasion of Cape Glouces­ter, December 1943. Cape Glouces­ter, December 1943. Cape Glouces­ter was located on the northern side of the far west of the island of New Britain. 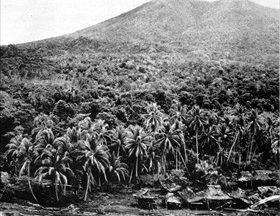 Right: The initial landings at Cape Gloucester had as their main objec­tive the iso­la­tion of Rabaul, 300 miles to the east on the other side of the island. The plan called for the Allies to secure Cape Glouces­ter’s beach­heads and capture the dual airfields to assist in planned attacks on the Japa­nese garri­son at Rabaul. 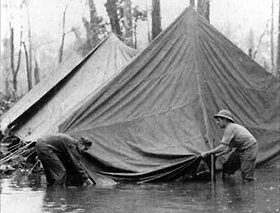 The Marines took the air­fields on Decem­ber 30, 1943, after slogging for three days through neck-deep swamps (marked “Damp Flats” on their maps), where men were actually killed by sodden branches falling from rotting trees. Impeded by heavy rains, Army avia­tion engi­neers worked around the clock to make Air­field No. 2, the larger of the air­strips, operational, a task that took them until the end of January 1944. In the end the two airstrips proved of marginal value to the Allies. 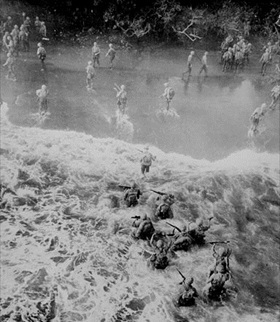 Above: Embattled Marines at times could see no more than a few feet ahead of them owing to the thick jungle (left frame). Retreating at first into the jungle of Cape Glouces­ter, Japa­nese soldiers finally gathered strength and counter­attacked their Marine pur­suers. 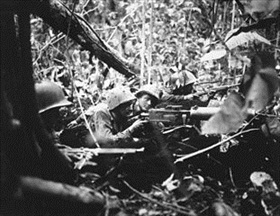 The photo in the right frame shows Marines in the forest’s darkness fending off a Japa­nese attack using an M1917 Browning machine gun. Marines needed three weeks of hand-to-hand combat to clear more than 10,000 enemy troops from the imme­diate area around Cape Glouces­ter. 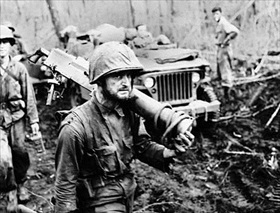 The Cape Glouces­ter base effectively bottled up the 135,000 Japa­nese troops at Rabaul, because the dense, jungle-swathed mountain ridges of the interior were impassable. Right: Move­ment on foot or by vehicle through the island’s swamp, jungles, and tall, coarse kunai grass verged on the impos­sible, espe­cially where mon­soon rains had flooded the land or turned the volcanic soil into slippery mud.